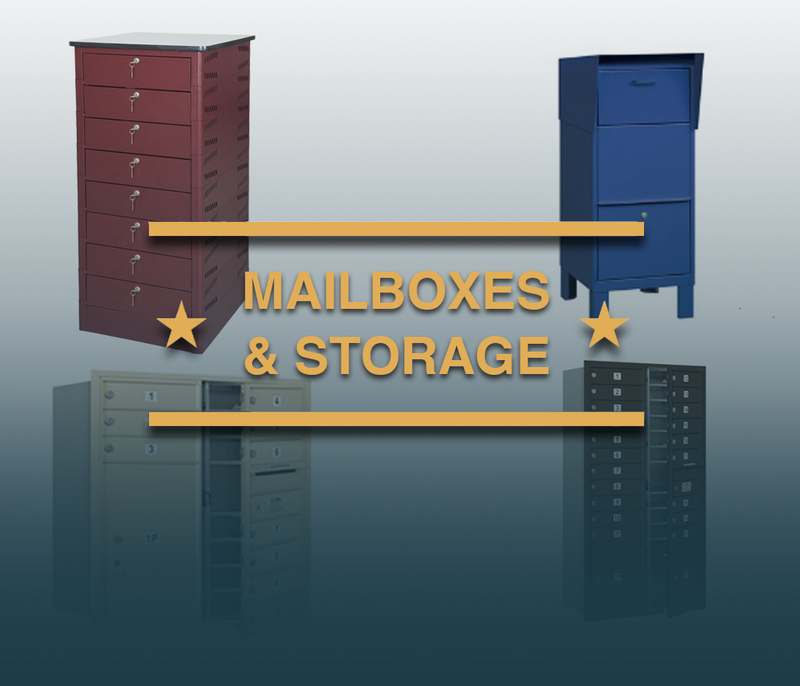 USA Building Supplies, an expanding distributor of commercial mailboxes is pleased to offer a wide array of centralized mail receptacles including cluster box units, 4C horizontal mailboxes, horizontal mailboxes, vertical mailboxes and more. Over the past decade, USA Building Supplies has expanded into additional products to fuel our growth with product offerings which include division 10 products, house numbers, cell phone lockers, mail sorters, matting, and other related products. This diversified business model that USA Building Supplies subscribes to provides additional buyer benefits including one stop shopping for all of your building supplies whether it be a multi-family complex, distribution center, office building, residential subdivision, or other type of building you are searching for supplies for. 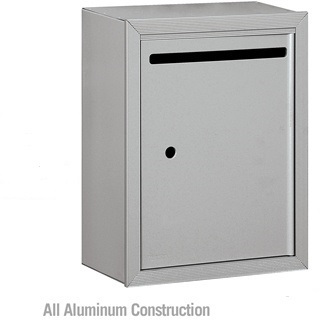 Commercial mailboxes are where USA Building Supplies has made their reputation as a knowledgeable full service supplier. 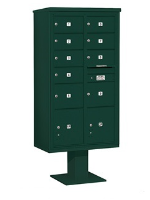 Whether you are looking for a centralized mail receptacle that is pedestal, recessed, or surface mounted, USA Building Supplies is sure to have the answer for your mailbox project. 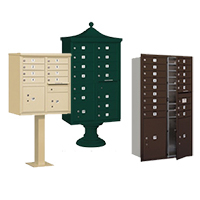 Most pedestal mailbox buyers’ end up purchasing one of our USPS Approved cluster box units or 4C pedestal mailboxes, because of the high quality craftsmanship we offer at great prices. In addition, USA Building Supplies’ experienced staff is willing and able to help you navigate through all of the current postal regulations, therefore can be confident the local delivering U.S. Post Office will be satisfied as well. Developers, architects, design build firms, and general contractors have come to rely on USA Building Supplies’ staff, whether build project is in planning, quoting, purchasing, or execution phase of their building project. Often, new construction projects are in need of assistance when selecting recessed mounted 4C horizontal mailbox configuration that suits their construction project. USA Building Supplies’ savvy sales team provides thorough shop drawings, quotes, and unsurpassed sales support to make the process simple for the commercial mailbox client. Sometimes, old mailboxes need to be replaced because they are an eye sore or no longer function properly. This is often where vertical and horizontal mailboxes enter the picture for centralized mailbox buyers. Unfortunately, many complexes when they are built do not take into account that one day the mail receptacles may have to be replaced and postal regulations may have changed, therefore the space necessary to comply with the latest regulations doesn’t exist. Fortunately, the USPS has grandfathered in horizontal and vertical mailboxes for exactly this purpose. USA Building Supplies encourages you browse their extensive line of vertical and horizontal mailboxes on their website, but by all means if you have any questions please contact their experienced staff. The explosion of ecommerce package deliveries and security has made many of USA Building Supplies’ products even more popular today. Ecommerce has made the company’s package drop boxes and collection boxes in high demand. The frustration that internet shoppers have when they order products from the worldwide web only to have them never arrive because they disappear as a result of in all likelihood at the hands of an unwanted visitor can be alleviated by purchasing a collection, parcel, or package drop box from USA Building Supplies. Key keepers for locked lobby entrances for postal employees to deliver the mail have become more commonplace as building owners become more security conscious. USA Building Supplies invites you to look around at our drop boxes and postal specialties area of our website for a solution that will help you protect your building, package, mail, and or other items. USA Building Supplies realized as a result of the real estate driven recession in the first decade of the 21st Century that it needed to offer a more full line of products to the marketplace. A natural extension of their product line was to offer mail distribution products for internal use in large companies, government offices, and other organizations. Through the years USA Building supplies had many customers that used some sort of commercial mailbox for document distribution or organization in their workplace; however mailboxes were not always the best solution for this problem. The company found that mail sorters and literature organizers offered the end users more on site flexibility, portability, and less cost in many end user applications. Clients loved the fact that many of USA Building Supplies mail sorters have adjustable shelves to accommodate different document volumes in an instance. 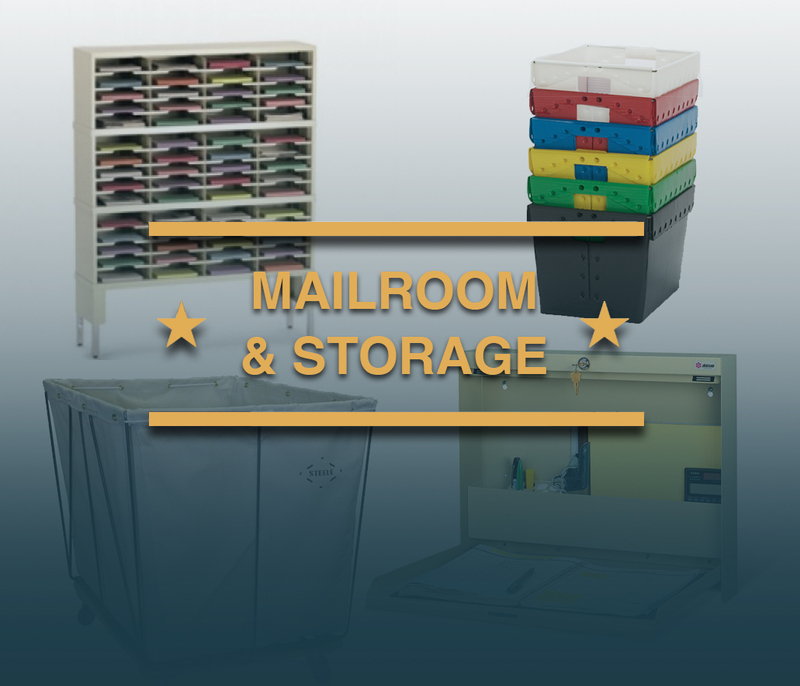 Today the company offers a full line of mail sorters, mailroom tables and related products that continues to grow to help companies run efficient operation internally. Many believe we have moved into the digital and mobile age of information, however their still an immense need for storage solutions for electronic devices. 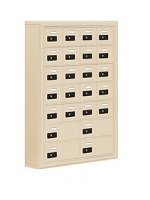 USA Building Supplies offers a full line of laptop lockers for laptops, tablets and more. These laptop lockers are extremely popular in training environments for corporate and government customers, because it allows the owners of the equipment to control the security of their information. Cell phone lockers, one of the best sellers at USA Building Supplies allows building owners to restrict mobile phones in certain areas of their facility, while providing secure storage for their guests. Cell phone storage lockers are becoming more and more of a building security necessity as the features mobile electronic devices increase. USA Building Supplies offers one of the largest available selections of cell phone cabinets available for sale on the worldwide web. Many of USA Building Supplies’ customers come from the new building construction industry as they are beginning to complete the final details of their construction project. Often, the general contractor is overwhelmed with small product purchases that fall within what is called Division 10 specialties and other related products. 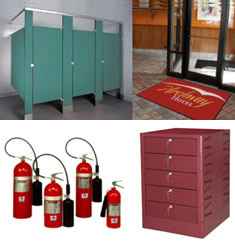 Project managers are overjoyed that they can purchase many of these products on one website whether it is commercial mailboxes, house numbers, apartment numbers, soap dispensers, hand dryers, restroom stalls, or other supplies from USA Building Supplies thus reducing the amount of paperwork for small percentage purchases. USA Building Supplies encourages you to contact one of our experience sales consultants to receive a comprehensive quote for all of your division 10 products and site amenities so we can offer you our best prices! 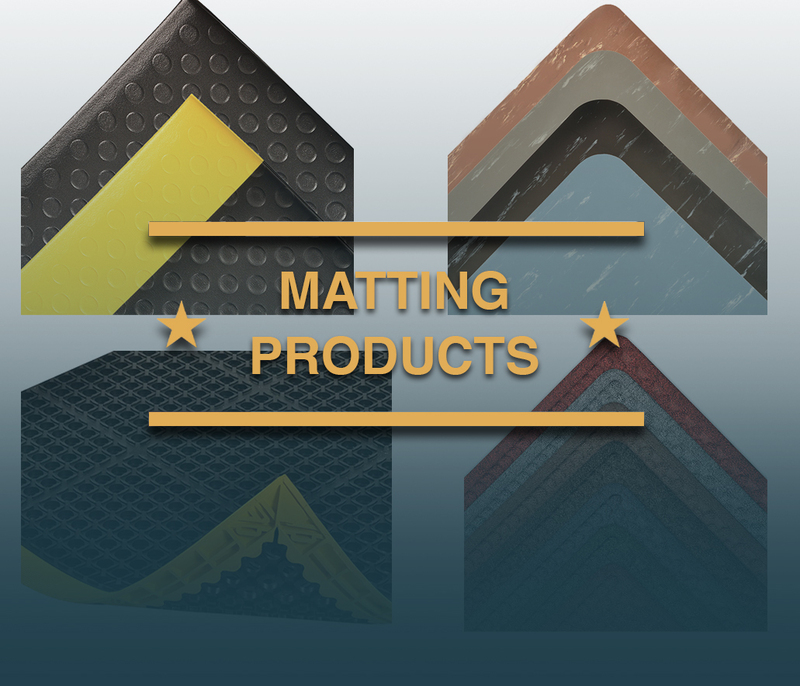 Whether you are looking for an entrance or anti-fatigue mat for an existing application in your already constructed building or you want to make sure you have that finishing touch addressed when your new building opens, USA Building Supplies has you covered. There are few products more universally utilized than floor mats for all types of buildings and you can get them all one website here at USA Building Supplies. Heck, we can even provide you with a logo mat to help brand your company or building if you would like. Take a look around our state of the art website and feel free to contact anyone our floor mat experts if you need assistance. Management at USA Building Supplies has promised more product solutions for their customers as we move through 2016. Company insiders haven’t provided us all of the details, however there are whispers that new partnerships with manufacturers that produce commercial mailboxes, cell phone lockers, mail sorters, mail carts, and mail hampers are just a few of the thing on the horizon for USA Building Supplies. 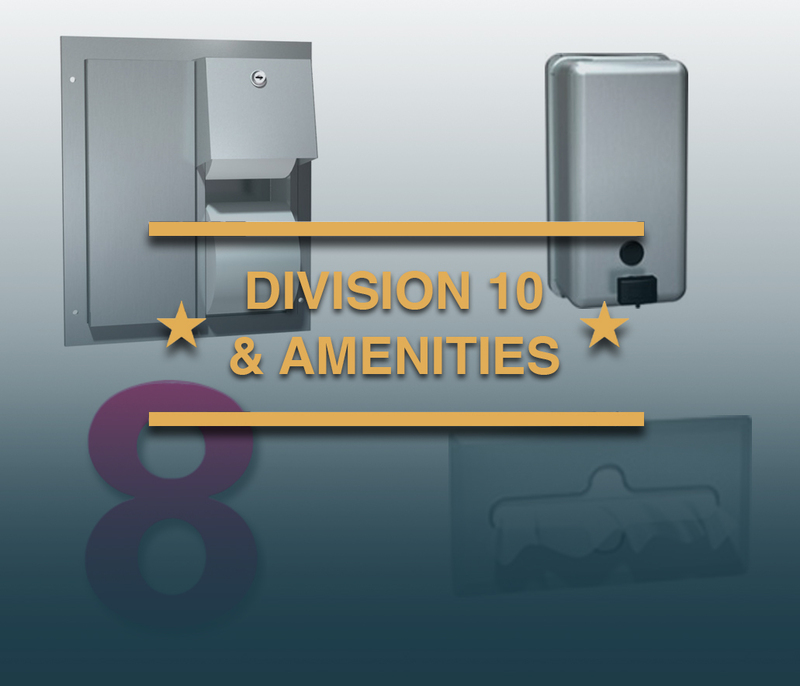 Contact the premium horizontal mailbox supplier for information on large selection of mailboxes, restroom accessories, storage solutions, fire protection products and Division 10 Products - CALL 1.855-373-5381.